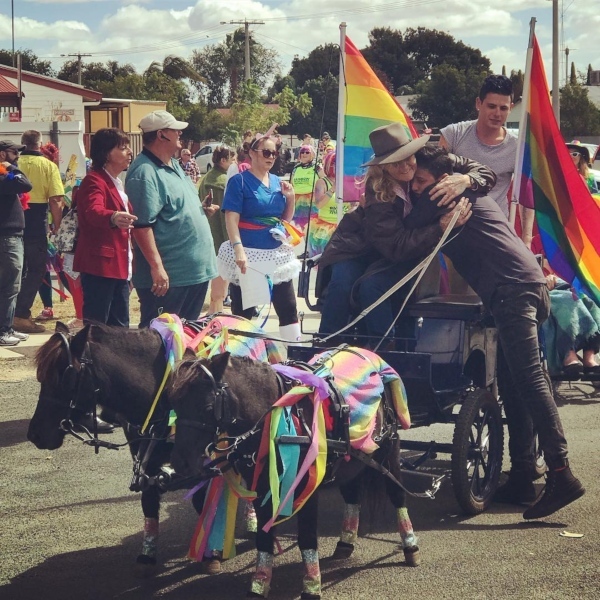 LGBTIQ+ community members in Regional Australia are seeing their lives change without having to leave their local areas as a result of the work being done to bring pride and kindness to country towns. 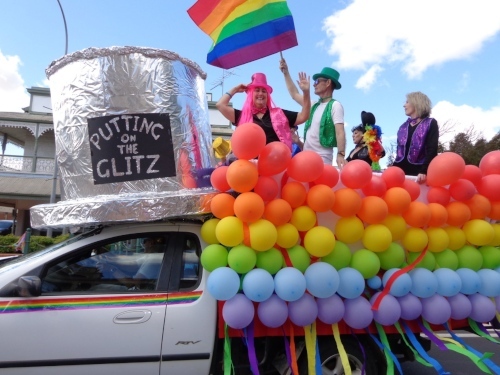 A fortnight after the second edition of the Rainbow Plains Festival in Hay came to a close, festival Vice Chairperson Liam Davies spoke with Gay Nation about the tremendous growth in numbers and the immediate plans for the future and also how the festival has changed the lives of so many from Hay. 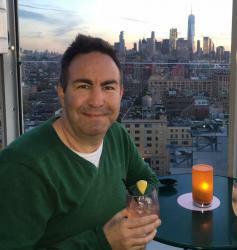 “It was incredible we had so many more numbers this year, the local community really embraced it and the support we received regionally and nationally was insanely humbling,” Davie explained to Gay Nation. “We had about 400 parade entrants in 40 separate groups, that’s around twice the size of last year. 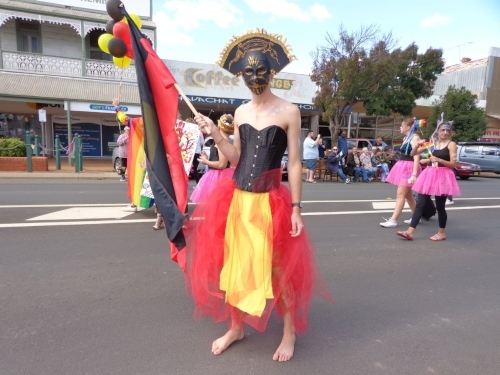 Some even said the parade was bigger than Broken Hill’s Broken Heel Festival which would be astounding if that’s true. “The fair day was shortly after the parade were we had around 600 people come in between and through the markets and for a small regional town we were breathless. Hay is the true Australian regional town, right in the middle of the Riverina area of NSW, similar distances from Sydney (725km), Adelaide (655km) and Melbourne (426km). This year the town’s main accommodation had been booked out for weeks, with some of the outlying regional towns also getting boosts from the number of people heading to the region for the weekend. Although the numbers were strong for just their second year Davies believes more work needs to be done to grow the event for years to come. “We need to strengthen our outreach outside of regional Australia and let everyone in Sydney, Melbourne, Brisbane know that we all here and if you want to see Country Australia in all its colour to come over. We all had so many travellers this year and last,” Davies said. “I think we need to work more with organisations similar to Acon, CASE and flourish and further our impact on the community and regional Australia, here we really have an opportunity to unite everyone and to provide the resources to needed communities such as isolated farmers, people of diverse background living in country Australia, people suffering from mental illnesses and LGBTQI Australians. “We’d like to look at how we can better help, and we’d like to contact and work with groups such as Start Out and connect with leaders that are instrumental to these causes. Davies said the festival continues to have a great personal impact and loves to see it have such a positive impact across his community. “When we had our launch night at the historic bishop’s lodge building, my mother amongst many other locals, came up to me and said how proud she was of the leader I’ve become. 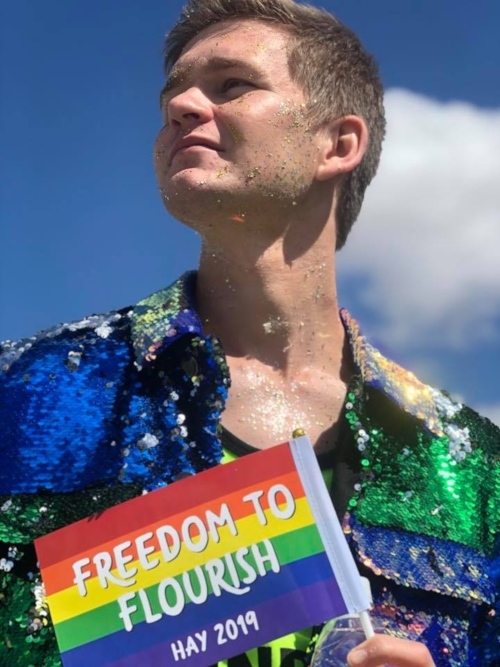 “That’s how I knew it was worth it, because I and the rest of Hay Mardi Gra decided to fight the good fight and make the town I never thought I’d be able to thrive in, the town where I was bullied alongside so many others, the town I hated, into a strong, positive and kind place. 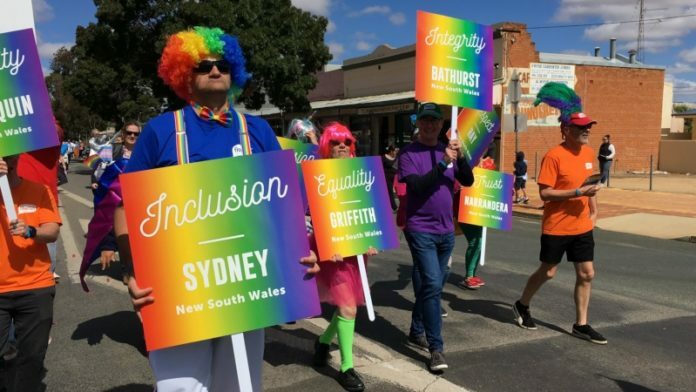 “A town where everyone is welcome and hear so many stories like mine since the Mardi Gras has only enforced it.